There are over 6,000 properties and districts listed on the National Register of Historic Places in New York State. 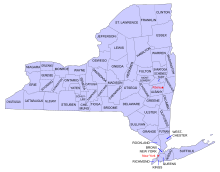 Some are listed within each one of the 62 counties in New York State. Of these, 258 are further designated as National Historic Landmarks. The numbers of properties and districts in New York State or in any of its 62 counties are not reported by the National Register. Following are approximate tallies of current listings from lists of the specific properties and districts. ^ a b The approximate counts are the best available. There are frequent additions to the listings, and occasional delistings, and the counts here may not be perfectly updated. Also, not counted are most boundary increase listings, which increase the area covered by a historic district and which carry a separate National Register reference number. An exception is Grand Central Terminal Park Avenue Viaduct which is treated here as a separate property, although it was added to the National Register as a boundary increase to the Grand Central Terminal. ^ The Albany Felt Company Complex is shared between the city of Albany and the neighboring town of Menands, and is thus on both lists. ^ The Hudson River Heritage Historic District is located in both the Rhinebeck list and the Dutchess County: Other list. ^ a b The New York State Barge Canal passes through both county and city. ^ Riverside Park and Drive is located in both the above 59th to 110th Streets list and the above 110th Street list. ^ Within Suffolk County, Long Island National Cemetery is included for both the towns of Babylon and Huntington. Bronx River Parkway Reservation is included in lists for both northern and southern Westchester. Old Croton Aqueduct is included in lists for both northern and southern Westchester, and the city of Yonkers as well. Wikimedia Commons has media related to National Register of Historic Places in New York.